This certainly isn't news anymore, but customer behaviour and expectations have changed dramatically in the last years. There’s a whole plethora of support options and channels, all suited for a variety of situations and purposes. Just as your customers hop between channels when consuming your content and buying from you, they also hop between channels when looking for customer support. As a result, self-service has become the new go-to stop before whipping out the old contact form or service phone number. In fact, according to Nuance Enterprise, 67% of consumers actually prefer self-service, over speaking to a company representative. In short, this means that the majority of the people who end up in your phone queues and ticketing system, have already attempted to resolve their issue on their own. This should paint a relatively straight-forward picture of the customer support flow, right? Your customers prefer to self-serve, so if the question is too complex to handle in your FAQ, they will just call you. Not quite! Funnily enough: over 50% of customers actually can’t find the information on company websites that would successfully solve their requests. So lets get this straight: companies set up self-service channels to deflect support tickets and improve customer satisfaction, but end up with the same people contacting them, just more frustrated? The study goes further to explain how consumers find web & mobile app self-service often hard to use, ultimately forcing them to contact the call center. Now, the reasons for this can be many fold and a mix of wrong terminology and internal jargon, poor user interface design as well as simply outdated information. But in this date and and age when our entire lives seem to revolve around digital products – these numbers seem staggering. How can companies still get it so wrong? 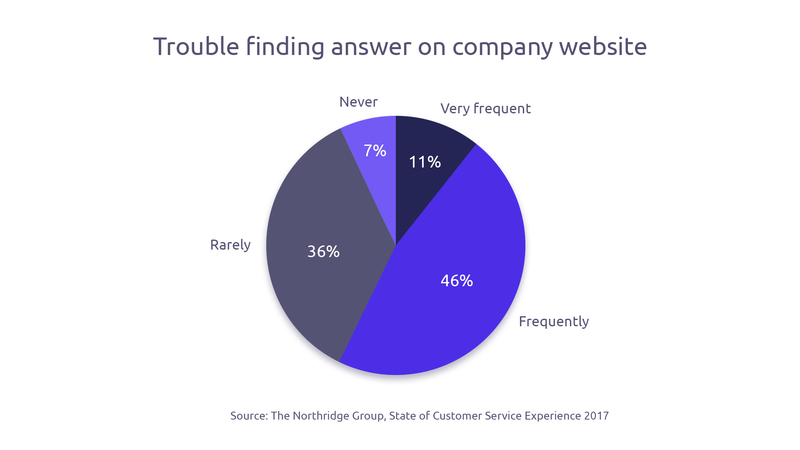 Your customers want help from you through all the channels all the time, but prefer helping themselves first, but cannot find what they’re looking for on your website. What a pickle. Let’s review the five most common self-service channel mistakes - and how you can turn that ship around. This one’s actually a big gun dressed as a freebie. It seems simple enough: you’ve done your market research, you know your customers better than anyone, right? Not so fast. Before making a plan, you need to understand the specifically when and why your customers reach out to your customer service. Do you have a top 20 list of the most common requests they have? Do you know what tools or channels they used before emailing you? Are the requests simple or rather complex – could he have figured it out himself, just with the right information? Many companies actually find out that they have an incomplete picture of their customers’ support needs and in worst cases, insufficient contact tracking to even gather that knowledge. Understanding your customers’ needs is the pre-requisite for any successful customer service project. In this case, it outlines necessary requirements of the self-service channel. Not to sound like a broken record but… you need clear goals. What do you want to achieve? Only you understand why your customers contact your support department to begin with, you can set concrete goals for your self-service channel. Is the ultimate KPI to reduce the number of support tickets, or to improve your CSAT-score? Do you want to manage staff better through business seasonalities? Maybe it’s a combination of goals? Setting clear, tangible goals helps measure the success of your self-service channel and aligns the channel with your company’s KPIs and OKRs. It gives you a starting point and helps you align the channel with your service organisation. In the end, the whole point of the self-service channel is that you can reach the larger goals of your service department, right? Arguably the biggest decision to make is regarding the type of self-service channel. Broadly speaking, there are two types: channels that provide a static experience and channels that provide an active experience. A typical static experience comes from FAQ-pages, which works really well if you need large quantities of text to provide a satisfying answer. The biggest advantages of an FAQ-type page or knowledge base are the low costs and low maintenance. Disadvantages would include a very static experience and the tendency to drive customers to informational “cul-de-sacs” where the next steps to a solution are not clear. Tracking the performance of the FAQ-pages is also traditionally quite tricky. Chatbots and virtual agents would be classified as providing an active experience. These channels start an interaction with your customer and can also provide a more personalised experience. Besides being able present a precise solution in mere seconds, the other advantages include a seamless handover to a human agent, which is required in more complex cases. By this time your service representative already knows the scope of the customer’s questions via chat history, which leads to a quicker resolution time. There's a lot of market confusion about what kind of chatbots and virtual agents there are and what they can do - to see what type of a chatbot matches your support needs, check out this article on chatbot classification. If you didn't take the time to make your channel usable... well, nobody is going to use it. No matter the type of self-service channel you decide upon, make it easy to use. This should be your mantra. After choosing and setting up your self-service channel, you want people to use it. Broadcast it, set it center stage; the more people resolve their issues through the channel, the bigger relief it will be for your human support department. Make your self-service channel the gateway to your other customer service channels and have your customers first interact with the virtual agent. If the issue is not resolved, the request can be automatically handed over to a real agent. The process is a bit like a two-way screening: your customers have the opportunity to solve the issue on their own, while only the requests that cannot be resolved in the self-service channel are let through to the next phase. Choose your wording so it is understandable for your customers and avoid internal jargon. Have someone who's not an employee proof-read the content. Work with a UI-designer to make the user interface intuitive and ensure that the solutions are easy to find. If your customers can’t navigate your self-service channel, you’re back to square one. Iterate, iterate, iterate. Your self-service channel is an ongoing project. You need to keep tracking the performance and make sure it’s kept up-to-date. Make changes incrementally – don’t try to overhaul the whole channel all at once. If certain questions get asked over and over again, they belong in your self-service channel. Obviously, remove questions and answers that have become obsolete. For static self-service channels, updating the content might involve manual work and very close collaboration with your customer service representatives. For active self-service channels, especially if using machine learning, the virtual agents proactively suggest new answers and further training for the bot. These insights nicely complement the first-hand feedback you get from your service team. So, successfully matching your self-service channel with your customers behaviour and expectations, you will create a valuable experience to both your customers and your business. Use these guidelines to find the right self-service channel for your organisation - or to improve the channel you already have. Good luck!